The raid came after police interrogated 14 suspects over planned suicide attacks. 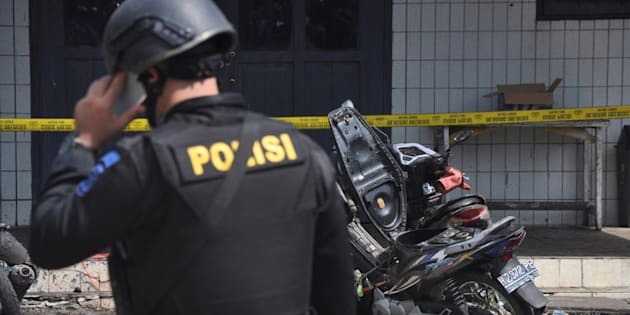 JAKARTA, Dec 21 (Reuters) -- Indonesian anti-terrorism police killed three suspects after a gunfight at a house south of the capital, Jakarta, where a bomb was found, a police spokesman said on Wednesday. "During the raid, we tried to be careful but they threw something from inside the house and it was a bomb but it did not explode. Then they fired from inside," national police spokesman Rikwanto, who like many Indonesians uses only one name, told Metro TV. "Inside the house we found a bigger bomb and now we are investigating it to try to detonate it," Rikwanto said. Ayi Supardan, a senior officer from South Tangerang police, said that, after initial interrogation of the suspect who was found alive, it appeared there was a plan to use the larger bomb at the end of the year.